← Dave Arnold: designing Montreal’s foodie renaissance one vintage sign at a time! I love coffee so much I named my blog after it, but sometimes, tea is the only thing that will do. It is very embarrassing to admit this, but sometimes I can’t make my cup of tea taste…just right. It either tastes too strong or too weak and milky. As a Brit, I consider this to be a devastating experience. Especially when I am running out of the house and don’t have time to start again. I guess it’s so dissapointing because when I do get it right, I am instantly transported back to my paternal grandmother’s house in Bury St. Edmunds, England. She would bring us tea with dark chocolate covered digestive biscuits very early in the morning while we were still in bed. Tea time at her house filled me with so much excitement because I felt very grown up drinking tea and eating white (gasp..) bread with real creamy butter and strawberry jam with the adults at 4 o’clock. For Christmas dinners, she made the best mouth-watering roast beef and yorkshire pudding. OMG. I decided to reach out to one of my good friends for some tea time advice and get control of this pitiful tea-ruining situation. Quentin’s wit makes me giggle to no end when we spend time together, but it is style that will impress you today. 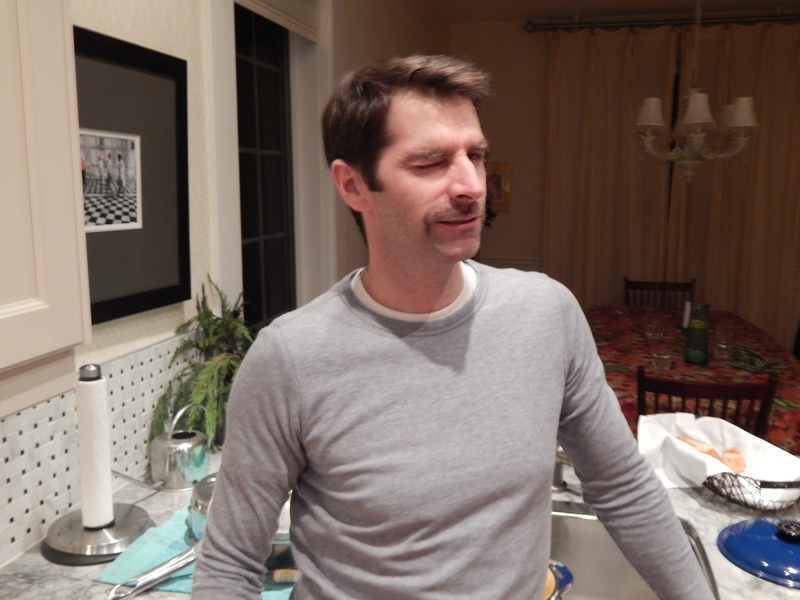 Quentin sports his Movember facial hair with true pinache. Forget it ladies, he is happily married. Donate to the Movember cause here. Me: Quentin, what is the secret to the perfect cup of tea? Quentin (with British accent): You have come to the right place. 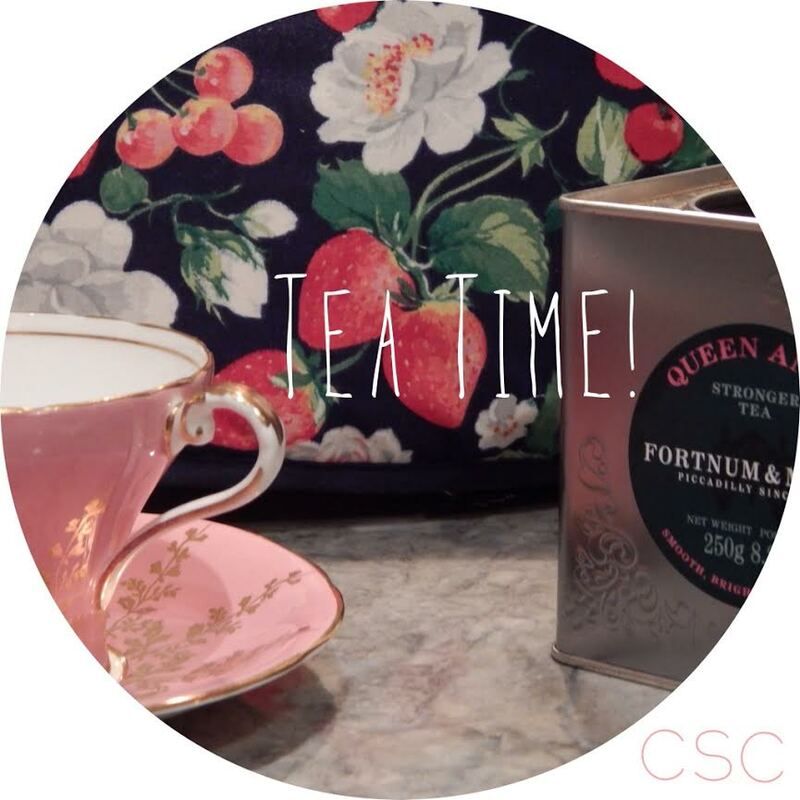 The perfect pot of tea starts with the right ingredients. Use tea leaves, not tea bags (tea bags can work, but are more hit or miss as it is hard to judge the quantity of leaves in any bag). 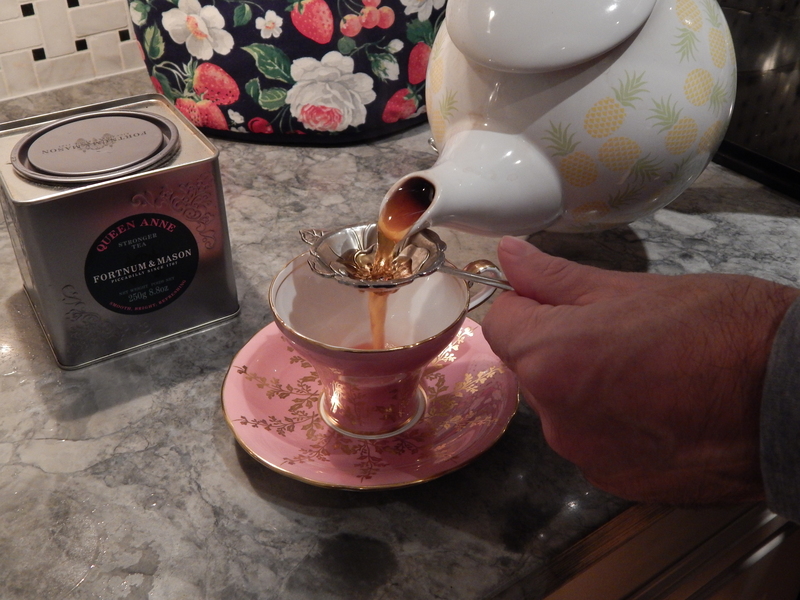 Favourite tea is of course Fortnum and Mason (this is being stocked now at Ogilvy’s for the Christmas period). My current top tea is “Wedding Breakfast” made to commemorate Will and Kate’s wedding (not sure if Ogilvy’s has this one). 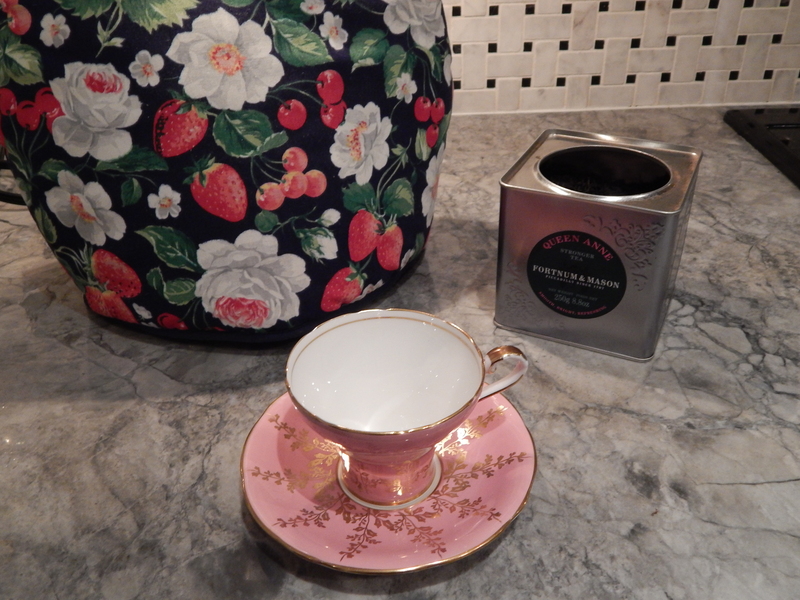 (Holt Renfrew does indeed have the Queen Anne tea for 18$, until they run out of stock). You will need water. Freshly drawn cold water. Some British treats now available at Ogilvy’s ! The perfect cup of tea continues with the right equipment. A tea cup. with saucer. fine china. the lip of the cup needs to be thin. Do not use a mug. Mugs are to be used only for trades people. Note: invest wisely in this equipment. if you have just two cups of tea a day, you will stare at and use this stuff 730 times in a year. Also, the teapot and especially the tea cosy will likely remain in view, on your worktop, all day. Make it count. Just before boiling point, pour water about half way up into the cups to be used. 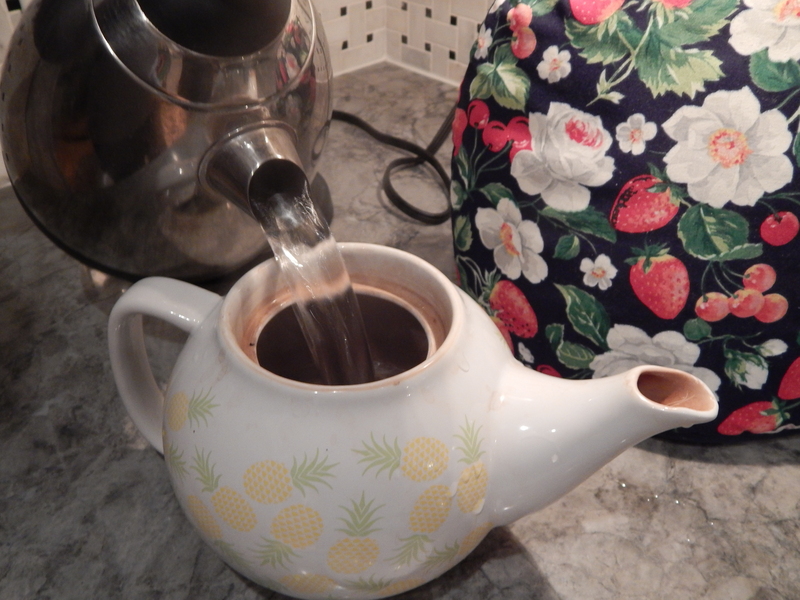 Then pour this water into the teapot. Add a splash more water into the pot and swirl around. Now the teapot and the cups are at “optimal” temperature. Now replace the kettle and let the water come to a full boil. Place one teaspoon of tea per person into the teapot. This is an art, not a science. Many factors are at work here: the strength of the tea leaves, your preference for strong or not so strong tea, etc. For example, I prefer a strong type of tea, brewed quite quickly rather than a weak type of tea brewed for a longer period of time. Basically, after two or three attempts you should get the feel of any particular tea leaf. Pour in freshly boiled water. Only pour in as much as you need plus a splash for “leaf absorption”. 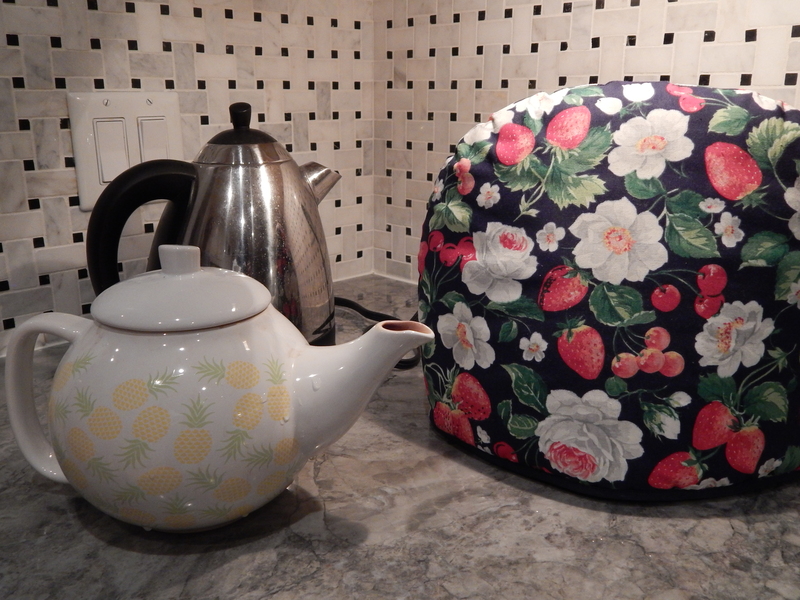 Place teapot under the tea cosy and wait anywhere between three and five minutes. Remember, art not science. Pour out remaining boiled water from the kettle and refill with cold water. Boil once more. Pour tea when ready using the tea strainer. Add milk. Before or after is your choice. I’m an “after” guy unless I know with absolute certainty the quality and colour of the tea, then I would pour the milk in first. It is very pleasing to see your perfect tea come together as it is poured. Refill teapot with newly boiled water and once more place under the tea cosy. This will be ready for a second round of tea once the first cup is finished. You can leave this second pot to steep a little longer than the first as some of the strength of the leaves will have gone. but be careful, too long and it will “stew” and taste bitter. Then I sit back, close my eyes, and enjoy. Butter both pieces. Butter, not marg. Butter. Soft. Now peel long strips from the cucumber. One side first, down to the seeds, then turn the cucumber over and repeat. Discard the seeds. Cut the lengths slightly longer than the slice of bread. Layer the cucumber strips on the bread and place the second slice of bread on top. Lightly pepper, but no salt (this will draw out the moisture and make the sandwich soggy. Now trim the four edges in perfect straight lines. Mix 4oz flour in a bowl with a pinch of salt and one tablespoon of baking powder. Make a well in the middle and add one lightly beaten egg and 100ml of milk. Stir to combine ingredients until smooth (no lumps). Carry on beating and slowly add a further 185ml of milk. Transfer this batter to a jug and put it in the fridge for 30 minutes. In a muffin tin (or to be fancy get a Yorkshire pudding tin), put two tablespoons of vegetable oil (or fat from the roast beef; or a combination of the two) in each well and place the tin in the oven until the oil is smoking hot. Now remove the tin and very quickly (so as to retain heat) pour the batter into the muffin tin. Put the tin back in the oven for 30 minutes or until the puddings have risen and are golden brown. Q: Wow! this is making me hungry. *sigh* Chocolate covered digestives with tea in bed! Pure heaven. Love it! Love it! Love it! I laughed the whole way through and learned an art-form at the same time. You and Quentin make a perfect team! Awesome post!!! !